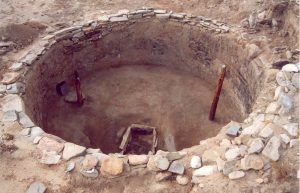 The discovery and excavation of two underground ceremonial chambers in the 17th century Tano Indian pueblo of San Lazaro in the Galisteo Basin outside of Santa Fe, NM. Now out of print and only available on the secondary market, this was the book Ric Hajovsky wrote detailing the discovery and excavation of two underground ceremonial chambers in San Lazaro Pueblo, a Tanoan site located in the Galisteo Basin, 17 miles south of Santa Fe, New Mexico. Besides detailing the excavation, the unusual features of the kivas, and the artifacts uncovered, the book includes a time-line of events at San Lazaro, starting with its founding in the 1100s and running through its abandonment in 1680. Also included is a history of the Tano migration from San Lazaro, from their 1680 departure to their arrival in Hano at First Mesa, Arizona in 1700. 166 color photographs, 17 black and white figures.